The UsuryFree Eye Opener: Who Rules America? 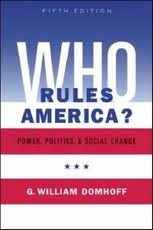 Article Sent in by G. William Domhoff, author of Who Rules America? This article was written by an investment manager who works with very wealthy clients. I knew him from decades ago, but he recently e-mailed me with some concerns he had about what was happening with the economy. What he had to say was informative enough that I asked if he might fashion what he had told me into a document for the Who Rules America Web site. He agreed to do so, but only on the condition that the document be anonymous, because he does not want to jeopardize his relationships with his clients or other investment professionals. "I sit in an interesting chair in the financial services industry. Our clients largely fall into the top 1%, have a net worth of $5,000,000 or above, and if working make over $300,000 per year. My observations on the sources of their wealth and concerns come from my professional and social activities within this group. Work by various economists and tax experts make it indisputable that the top 1% controls a widely disproportionate share of the income and wealth in the United States. When does one enter that top 1%? (I’ll use “k” for 1,000 and “M” for 1,000,000 as we usually do when communicating with clients or discussing money; thousands and millions take too much time to say.) Available data isn’t exact. but a family enters the top 1% or so today with somewhere around $300k to $400k in pre-tax income and over $1.2M in net worth. Compared to the average American family with a pre-tax income in the mid-$50k range and net worth around $120k, this probably seems like a lot of money. But, there are big differences within that top 1%, with the wealth distribution highly skewed towards the top 0.1%. The 99th to 99.5th percentiles largely include physicians, attorneys, upper middle management, and small business people who have done well. Everyone’s tax situation is, of course, a little different. On earned income in this group, we can figure somewhere around 25% to 30% of total pre-tax income will go to Federal, State, and Social Security taxes, leaving them with around $250k to $300k post tax. This group makes extensive use of 401-k’s, SEP-IRA’s, Defined Benefit Plans, and other retirement vehicles, which defer taxes until distribution during retirement. Typical would be yearly contributions in the $50k to $100k range, leaving our elite working group with yearly cash flows of $175k to $250k after taxes, or about $15k to $20k per month. Until recently, most studies just broke out the top 1% as a group. Data on net worth distributions within the top 1% indicate that one enters the top 0.5% with about $1.8M, the top 0.25% with $3.1M, the top 0.10% with $5.5M and the top 0.01% with $24.4M. Wealth distribution is highly skewed towards the top 0.01%, increasing the overall average for this group. The net worth for those in the lower half of the top 1% is usually achieved after decades of education, hard work, saving and investing as a professional or small business person. While an after-tax income of $175k to $250k and net worth in the $1.2M to $1.8M range may seem like a lot of money to most Americans, it doesn’t really buy freedom from financial worry or access to the true corridors of power and money. That doesn’t become frequent until we reach the top 0.1%. I’ve had many discussions in the last few years with clients with “only” $5M or under in assets, those in the 99th to 99.9th percentiles, as to whether they have enough money to retire or stay retired. That may sound strange to the 99% not in this group but generally accepted “safe” retirement distribution rates for a 30 year period are in the 3-5% range with 4% as the current industry standard. Assuming that the lower end of the top 1% has, say, $1.2M in investment assets, their retirement income will be about $50k per year plus maybe $30k-$40k from Social Security, so let’s say $90k per year pre-tax and $75-$80k post-tax if they wish to plan for 30 years of withdrawals. For those with $1.8M in retirement assets, that rises to around $120-150k pretax per year and around $100k after tax. If someone retires with $5M today, roughly the beginning rung for entry into the top 0.1%, they can reasonably expect an income of $240k pretax and around $190k post tax, including Social Security. While income and lifestyle are all relative, an after-tax income between $6.6k and $8.3k per month today will hardly buy the fantasy lifestyles that Americans see on TV and would consider “rich”. In many areas in California or the East Coast, this positions one squarely in the hard working upper-middle class, and strict budgeting will be essential. An income of $190k post tax or $15.8k per month will certainly buy a nice lifestyle but is far from rich. And, for those folks who made enough to accumulate this much wealth during their working years, the reduction in income and lifestyle during retirement can be stressful. Plus, watching retirement accounts deplete over time isn’t fun, not to mention the ever-fluctuating value of these accounts and the desire of many to leave a substantial inheritance. Our poor lower half of the top 1% lives well but has some financial worries. Since the majority of those in this group actually earned their money from professions and smaller businesses, they generally don’t participate in the benefits big money enjoys. Those in the 99th to 99.5th percentile lack access to power. For example, most physicians today are having their incomes reduced by HMO’s, PPO’s and cost controls from Medicare and insurance companies; the legal profession is suffering from excess capacity, declining demand and global outsourcing; successful small businesses struggle with increasing regulation and taxation. I speak daily with these relative winners in the economic hierarchy and many express frustration. Folks in the top 0.1% come from many backgrounds but it’s infrequent to meet one whose wealth wasn’t acquired through direct or indirect participation in the financial and banking industries. One of our clients, net worth in the $60M range, built a small company and was acquired with stock from a multi-national. Stock is often called a “paper” asset. Another client, CEO of a medium-cap tech company, retired with a net worth in the $70M range. The bulk of any CEO’s wealth comes from stock, not income, and incomes are also very high. Last year, the average S&P 500 CEO made $9M in all forms of compensation. One client runs a division of a major international investment bank, net worth in the $30M range and most of the profits from his division flow directly or indirectly from the public sector, the taxpayer. Another client with a net worth in the $10M range is the ex-wife of a managing director of a major investment bank, while another was able to amass $12M after taxes by her early thirties from stock options as a high level programmer in a successful IT company. The picture is clear; entry into the top 0.5% and, particularly, the top 0.1% is usually the result of some association with the financial industry and its creations. I find it questionable as to whether the majority in this group actually adds value or simply diverts value from the US economy and business into its pockets and the pockets of the uber-wealthy who hire them. They are, of course, doing nothing illegal. I think it’s important to emphasize one of the dangers of wealth concentration: irresponsibility about the wider economic consequences of their actions by those at the top. Wall Street created the investment products that produced gross economic imbalances and the 2008 credit crisis. It wasn’t the hard-working 99.5%. Average people could only destroy themselves financially, not the economic system. There’s plenty of blame to go around, but the collapse was primarily due to the failure of complex mortgage derivatives, CDS credit swaps, cheap Fed money, lax regulation, compromised ratings agencies, government involvement in the mortgage market, the end of the Glass-Steagall Act in 1999, and insufficient bank capital. Only Wall Street could put the economy at risk and it had an excellent reason to do so: profit. It made huge profits in the build-up to the credit crisis and huge profits when it sold itself as “too big to fail” and received massive government and Federal Reserve bailouts. Most of the serious economic damage the U.S. is struggling with today was done by the top 0.1% and they benefited greatly from it. Not surprisingly, Wall Street and the top of corporate America are doing extremely well as of June 2011. For example, in Q1 of 2011, America’s top corporations reported 31% profit growth and a 31% reduction in taxes, the latter due to profit outsourcing to low tax rate countries. Somewhere around 40% of the profits in the S&P 500 come from overseas and stay overseas, with about half of these 500 top corporations having their headquarters in tax havens. If the corporations don’t repatriate their profits, they pay no U.S. taxes. The year 2010 was a record year for compensation on Wall Street, while corporate CEO compensation rose by over 30%, most Americans struggled. In 2010 a dozen major companies, including GE, Verizon, Boeing, Wells Fargo, and Fed Ex paid US tax rates between -0.7% and -9.2%. Production, employment, profits, and taxes have all been outsourced. Major U.S. corporations are currently lobbying to have another “tax-repatriation” window like that in 2004 where they can bring back corporate profits at a 5.25% tax rate versus the usual 35% US corporate tax rate. Ordinary working citizens with the lowest incomes are taxed at 10%.